The optimism on trade together with the U.S. Federal Reserve pausing its rate tightening efforts and Britain lawmakers getting an extension on the country&apos;s exit from the European Union helped lift the mood in equities markets. In early European trades, the pan-region , Germanand London&apos;sfutures each rose about 0.2 percent. E-Minis for thewere little changed. MSCI&apos;s broadest index of Asia-Pacific shares outside Japan climbed 0.4 percent to its highest since late July. Chinese shares were buoyant, with the blue-chip CSI300 index rising 0.6 percent. Hong Kong&apos;sadded 0.3 percent while South Korea&apos;srose 0.5 percent. 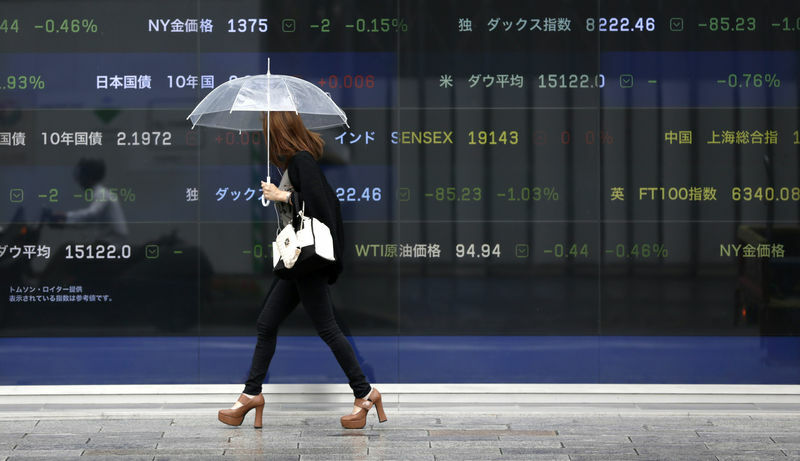 Japan&apos;salso joined the party, gaining 1.4 percent to close at its highest since early December. On Saturday, Mnuchin said a U.S.-China trade agreement would go "way beyond" previous efforts to open China&apos;s markets to U.S. companies and hoped that the two sides were "close to the final round" of negotiations. "We expect a relatively market-friendly U.S.-China deal," Bank of America Merrill Lynch (NYSE:) global economist Ethan Harris said in a note. "In our view, market and political concerns will constrain future fights. Think &apos;skirmishes&apos; rather than &apos;major battles.&apos;"
Investors are next looking to China&apos;s March-quarter gross domestic product data due Wednesday. A Reuters poll predicted it would show growth slowing 6.3 percent from a year earlier, the weakest pace since the global financial crisis a decade ago. In currencies, thewas 0.1 percent weaker at 96.863 against a basket of major currencies as demand for safe haven assets eased. It had slipped to a near three-week trough of 96.745 on Friday.